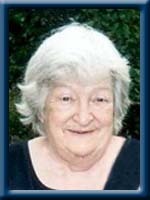 McGinnis, Frances Joan, 79, passed away at Queens General Hospital on February 8th, 2013. Formerly of Saint John, N.B. , she was the daughter of the late James Andrew and Mary Alice (Martin) Grey. Frances had resided at Queens Manor for several years and was an active member of St. Gregory’s Catholic Church. She is survived by her daughter Mary Alice Lecour (Wade) of Brampton, ON; son Ken McGinnis (Ann) of Liverpool, N.S. ; sister Dolly (Gray) Jones of Oshawa, Ont. 8 grandchildren, 5 great-grandchildren, many nieces and nephews. She was predeceased by her daughter Bridgette, son John; 9 brothers and 3 sisters. So sorry to hear of your Mom & Grandmother’s passing.I met her at the Manor when i went to visit my Mom.She was a very friendly lady, and i enjoyed visiting with her as well. She always had a warm smile for me each time i went, and a friendly” Hello”She invited me in to show me her wall of family pictures ,which she was very proud to share..My thoughts and prayers are with you all, Cherish your memories, & God Bless.!! Sorry to hear of the passing of your Mum. I’ll always remember the gifts of faith she gave me (Crystal) and how she treated our son Christopher as one of her own grandchildren when he came to visit. She was a kind and loving person and I know she will be missed greatly. Be comforted knowing she is with our Lord now and her suffering is no more. May God hold you in His hands and help you through this time of loss.